We have been in the house for three weeks now and most (maybe that is a little optimistic) of the boxes are gone. There is still a lot of sorting out to do, but hopefully the worst is over and the admin stuff is on the way too. I can say categorically that 'I AM NEVER MOVING AGAIN!' I have such itchy fingers to get back to my sewing though, that today I began thinking about the curtains and what I need to make. We are lucky - the house doesn't need any urgent decorating or remodelling, so we can take our time with it all. After living in rented houses in foreign countries since 2002, the idea of choosing paint colours and fabrics for our home is somewhat 'overwhelming'. What fun!!! The only room I actually have curtains for is the dining room. 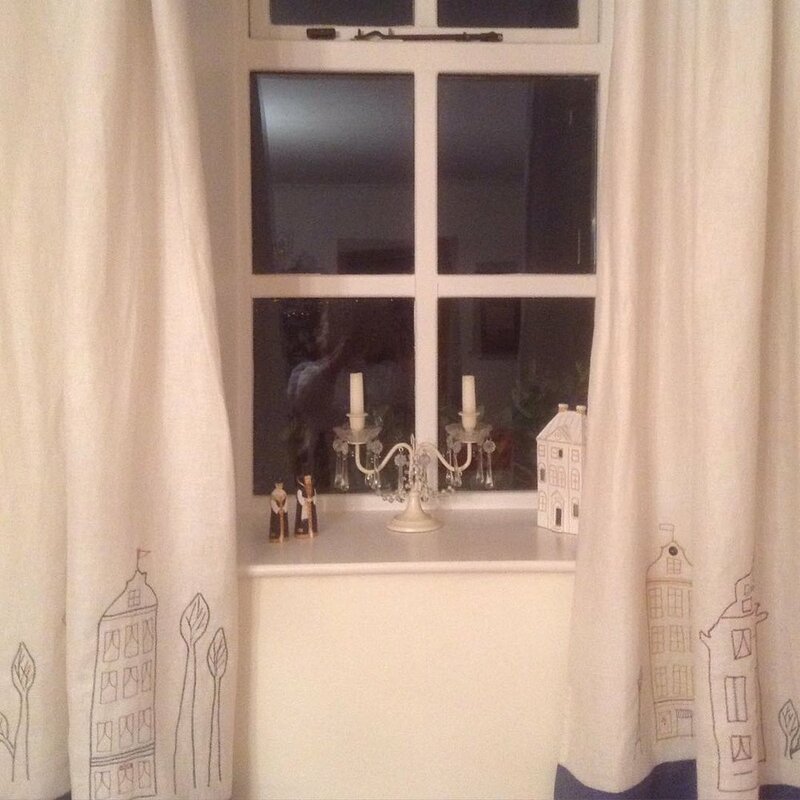 I did make these curtains for the house in Sweden after being swept up with an idea from Clare Young's wonderful book 'Scandinavian Needlecraft'. 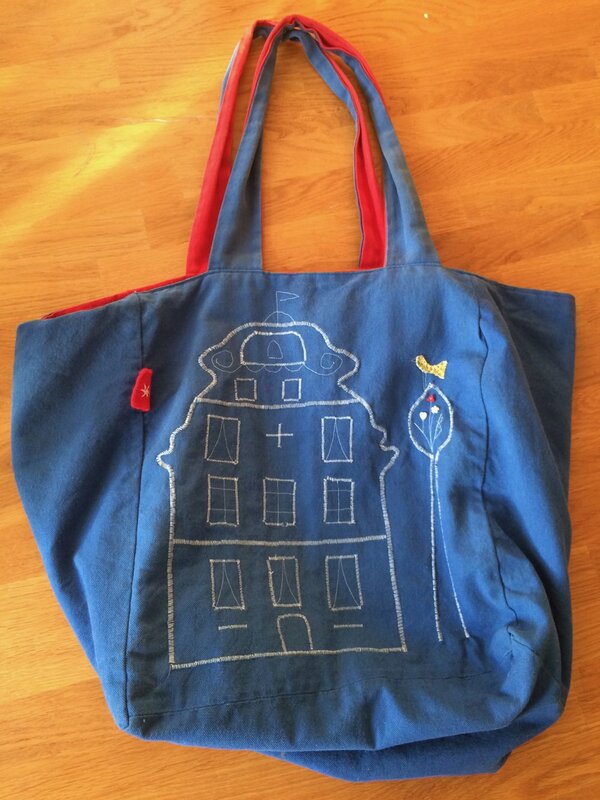 In the book there is a lovely tote bag featuring a scandinavian house design, outlined on the machine - I was completely taken up with this idea and as usual, got rather carried away. It is suprisingly simple to do - most of the outlining is a simple close zig-zag stitch. 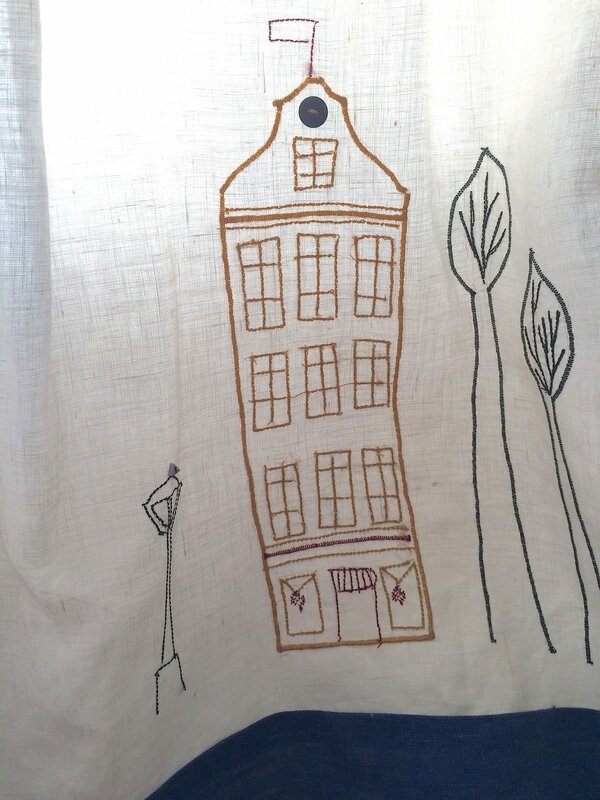 You simply draw your outline onto your fabric using a fabric pencil and stitch around. I began experimenting with the technique, but using some of the decorative stitches on my machine. It's a great way to try out all those sitches on your machine that you never think you will use. I made a few more bags, including this one for my sister. So with one room done already - the next room to tackle is my sewing room. This is a bit of a mess at the moment as I don't have any shelves up yet, so everything is in enormous piles everywhere. What I do have (of course) is fabric and it couldn't be more perfect. I bought this in Montmartre about 5 years ago -how could I have known that the walls in my sewing room would be ruby red (lol!). What do you think?